This website is hosted by Brighterlouder on behalf of NTS London. All content, including the design, is the intellectual property of NTS London, except for third-party templates, graphics and software which is the intellectual property of their respected authors and credit has been given where applicable. Questions regarding the content of the website should be directed to London NTS via the contact form. The NTS London website does not store or capture personal information, except for that provided voluntarily via the feedback and contact forms, and does not make any attempt to find out the identities of those visiting our website, but merely logs general visitor data which is collected and used to improve and maintain the website for the visitors benefit. All of the clinical information given on this website is believed to be correct at the time of publication but is not guaranteed to be free of error or omission and is provided as a guide only. It is the responsibility of the attending clinician to satisfy themselves of diagnosis, treatment, drug doses and infusions, and to take full responsibility for the care of their patient. 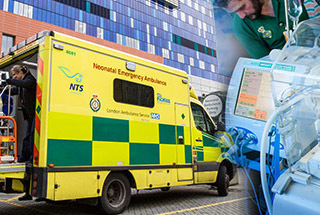 NTS London will be happy to advise on the stabilisation and care of any neonate accepted for transfer. If you believe any clinical information to be in error, please contact NTS London via the contact form. The contact and parental feedback forms are a convenient way to contact NTS London and to provide your valuable feedback as parents. These pages, and the whole website, use industry-standard SSL encryption. This means that the data passed between your device or computer and our web servers is scrambled, making it much more difficult for a third party to intercept your information. You can check that you have a secure connection by looking for the Padlock icon near your web browser’s address bar. As for all websites, it is still possible for your information to be intercepted by another person, particularly if you use a public Internet connection such as free WiFi networks, although in practice this is very unlikely to happen. NTS London can also be contacted using the telephone number on the contact page.